I'd love for you to check out my cousin's INNOVATION. Technically it's my cousin's wife's innovation but I don't like technicalities so we are calling her my cousin. Actually her name is Lacey. Anyway, Rambler is a play mat that stays flat. It is a brilliantly basic concept, and because of Lacey's keen eye for aesthetics, Rambler is brilliantly beautiful as well. Real people (not actors) enjoying Rambler. Their names are Lacey and Baby. 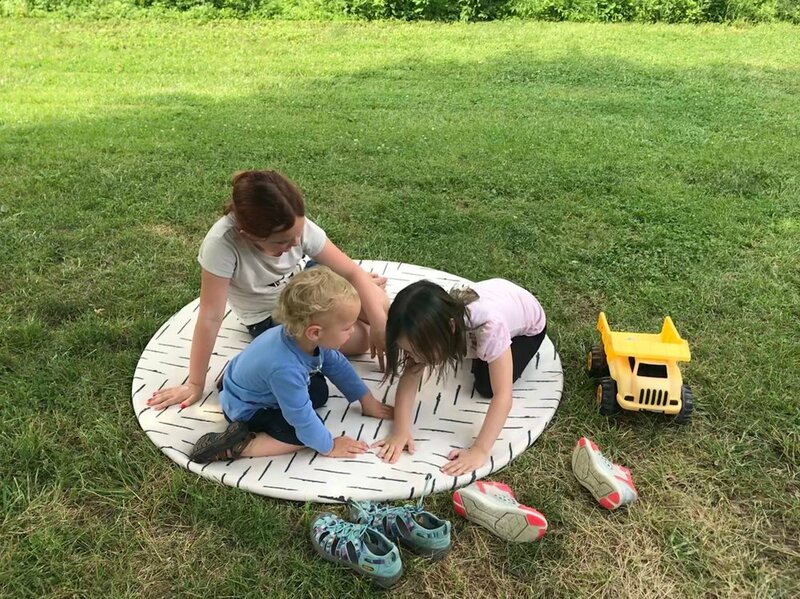 The mat opens to provide a soft, round surface area that does not bunch and scrunch when one sits, lays or steps on it. Rambler was a spark of creative genius born from discouragement and frustration with every mom's car-trunk go-to: the what's-even-the-point flimsy blanket. Why spread a blanket across the floor if it insists on eating up your tiny delicious baby? The baby-eating blanket monster eating my cousin’s baby. It works. We have four kids and have traipsed our Rambler all across the state of Ohio - baseball games, camping trips, backyard bonfires, swimming pools. No matter what, it is where my kids gravitate because the mat is always perfectly flat and exactly where they left it. My whole world on a Rambler mat. It is durable, soft, and easy to clean. We are not precious about our Rambler. It has been in the dirt, mud, sand, concrete. It has been stepped on, spilt on, messed on, and peed on (apparently Billy Madison was right - it's cool to pee your pants.) No matter how badly we muck it up, it always returns to like-new because it is machine washable and easy to wipe clean. Rambler and toddler wipe clean. Brushed polyester blend, otherwise known as really freakin’ soft. It's convenient. Rambler magically opens to over 4 feet wide and easily closes to a small, lightweight diameter of 18" that fits into a generously roomy carry bag. Closing the Rambler is strangely enjoyable and will make you feel like David Copperfield. Lacey, somewhere over the rainbow, with Rambler in its carry bag. Here's why I want you to consider this product: It is wonderfully functional for kids AND adults of all ages. 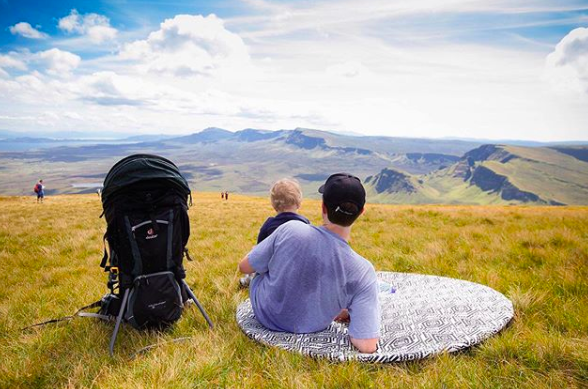 It's perfect for the tiny newborn who is too tender to make contact with the dirt; it is ideal for young kids who exhaust their parents by thinking that picnics are fun; and it's a stylish and luxurious mat for adults who like wine and cheese or in my case, Diet Coke and Fritos. Also a real person (not an actor): my cousin Jordan with Baby, rocking the Rambler. Here's the deal. Lacey has launched a kickstarter campaign to take this product to the next level. You can buy the mat right now online for $109* (I promise, you get what you pay for with Rambler - high quality and a gazillion uses) AND/OR you can support her kickstarter campaign with one of three pledge levels, each that includes one of three various Rambler sets (the $69 pledge level is an absolute steal). *Oh, what’s that? You want a discount code. Coming right up. Use Ali15 at checkout for 15% off your RAMBLER!!! Thanks for the love, Lacey. I am sharing this with you because 1) I love Lacey. She's kinda awesome and by kinda awesome I mean my cousin married way up and our family is better for it. Sorry Jordan. 2) I genuinely love this product. I don't leave home without it. I am such a fan and you will be too. Pinky promise. 3) I really want the new Rugged mat in CLAY - so please, let's do this y'all. 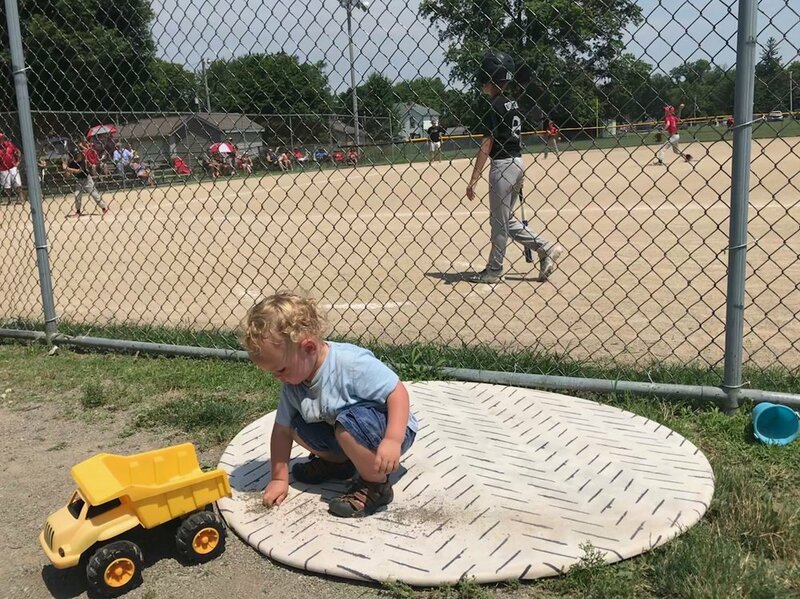 Let's make this happen so that I can have my Rugged Clay mat and we can have a baby-eating blanket monster burn party while we sit on our baby-bunny-soft Ramblers and eat Fritos. I couldn’t resist another picture of tiny Forest, I mean, the Rambler. Don’t forget the discount code Ali15 for 15% off your RAMBLER. Older PostMama's got a brand new bag.